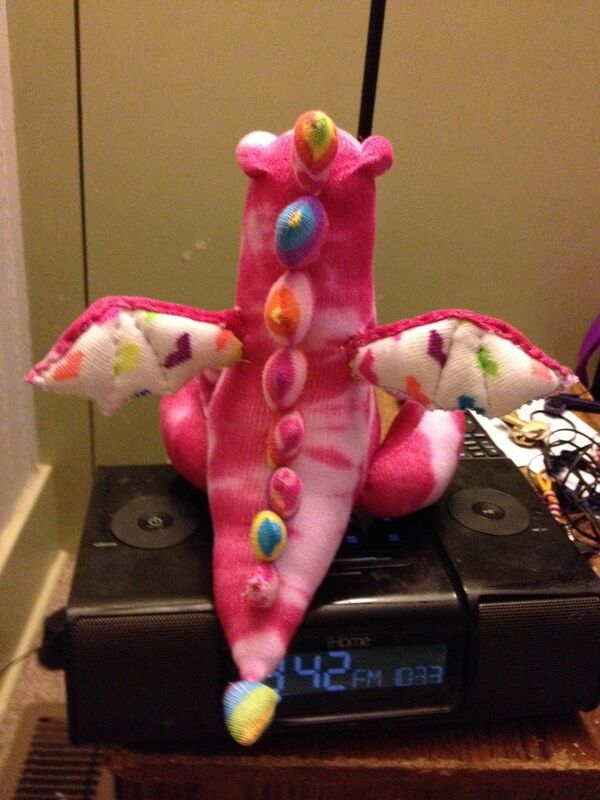 After designed, developed and shared several sock toy sewing patterns with you, here is another sock toy pattern which is more challenging to sew, Drake the sock dragon. If you have mastered the sock toy sewing skill from the previous sock toy pattern, then probably you will find this not as tough as it looks. Drake the sock dragon is the evolution species from the Japanese famous reptilian sea monster, Godzilla. Unlike it’s ancestry, Drake is a kindhearted dragon who affectionates on peace and love. Drake no longer an amphibian, it can’t live in the water, instead, it develops a pair of wings for him to fly. However, Drake has inherited the furrowed brows, Spiky back and tail, and strong foot. Its feet and arms are shorter as it needs them just for walking and hugging. Drake has grown a bigger tummy which makes it a little clumsy to walk around. It prefers to sit down and relax by the river and fishing for its meal. Drake is slightly difficult to sew as it has more parts to sew and attach. In order to ease the sewing a little, I have made the templates for the arms, feet, wings, and spikes. You can get all the detailed instruction and downloadable pdf template in page 2. Frankly, if you find that sewing all those little parts are so time-consuming, you may adapt the wings and spikes to using felt. Trace the spikes on a piece of felt in a continuous form, cut it out in 1 piece and sew it on the back. “Gimme, gimme, gimme a BIG HUG!! !” Drake the sock dragon is asking for some TLC. It is also hoping to see and meet it’s relatives soon. Please sew the sock dragon and show us when it is done!!! The Sock Unicorn Whale (Narwhal) is sewed from an adult ankle sock. The length of the sock unicorn whale is roughly 9" long from head to tail. For your ease of sewing, free pattern template is included along with the details of the instruction. Sock Raccoon is a stuffed softie animal sewed from a pair of striped microfiber chenille socks. It is about 8" tall, with a cuteness overloaded expression. A best handmade gift to sew for any occasion. Joanne estou amando tudo que está no seu blog.Muito obrigada pelos graficos livres, seus bichos são cada um mais lindo do o outro. Joanne I’m loving everything that is on your blog. Thank you so much for the free graphics, your animals are each more beautiful than the other. Mine turned out like absolute garbage.. a video on how to make it would have been nice. Sorry if I missed it but what size socks do you recommend? Is there a step by step video? Sorry, I do not have a video on this. Hi! Love this dragon! Do you think you could tell me where to buy thoughts sock? I hope you can find some beautiful colored socks in your local shop. Otherwise, you may try to find them at Craft Passion Store. Iam brasilian e loved your job! Lino seus bichinhos!!! Kisses. Iam brasilian and loved your job! Lino their pets !!! Kisses. I made one of these, and it turned out so well! Excellent tutorial! The cost of the materials was very low and even with low experience I was able to make a great dragon! They were old (clean!) socks so a little bobbled! Great tutorial! I tackled this before any of your other sock toys and adapted it slightly to make flared nostrils and dragon eyes from buttons! This is sooo cool! I love the color combination, especially the rainbow colored belly and tail! love it so I featured it in my own blog: http://www.plushiepatterns.com/sew-sock-dragon/ thanks again for this dragon tutorial..it’s cheap, fun, and so easy to make! I am having trouble on drakes wings….you said to use a running stitch to make his wings look like bat wings. Well mine aren’t getting the definition to them that yours have…? Can you help me? Hi Chantel, would love to help. Do you mind send me a photo via the contact form for me to have a look? Thanks. Hi Chantel, the stitches have to go to the other side of the wing. Hope this explained. Hej, just want to say thank you for your wonderful and easy to follow sock-animal-tutorials! I finished the dragon today, and my son loves it! Last year I made one of the bunnies and the sock monkey, it is really fun to make them! Hi Maryam, this is great to know!!! Mind to share a photo to show us? Hey, I’m making this dragon now and I’m stuck with the brows. I can’t understand how the stitch is going. I looked at the owl tutorial but it’s not helping me. Can anyone help me understand this stitch? Hi Linda, sorry about the the brows. Let me try to explain here, as you can see from the picture b, there are dashed lines indicated on the head. Sew a ladder stitch from left to right, then from right to left on the dashed lines. After you have finished with the sewing, pull the thread to make the brow bumps up. Hope this helps. I just wanted to say that your patterns are amazing, and that you are very creative and inspiring! Thank you for sharing your talent with us! awww this chap is TOO cute! perfect for my Nieces christmas present this year! thank you! I put some of your patterns on my website and linked back, hope you dont mind. Hi! I am making this as I am living you a comment. I love this creation of yours and so is my soon to be 4 year old son. It was suppose to be a surprise gift for his b-day but hard to do with a boy who’s constantly over my shoulder asking what I am doing ha! ha! ha! now he wants me to finish it today. I want to say how grateful I am to you for sharing all your creativity and work of arts. Than you a million times over! Maria, I can feel your joyful moment 🙂 Your son is lucky to have you sewed for him !!!! I noticed that on the template it said not for sale, is that the pattern or does it mean that any cute little drakes I make I can’t sell? I had fun with this project using tie dyed adult socks. OMG this is adorable! I have an overabundance of white socks and didn’t want to make plain white dragons – I’ll have to give tie dye a try! I’m expecting my first child and I’ve been trying to practice my sewing. This looks like it will be a fun challenge for me, and an adorable toy for my child once he’s a bit older. Just love your sock animals! Will you be creating any more? Are you selling this little guy? My daughter would LOVE this one. The colors are perfect. Hi Kristal, sorry, this is not for sale but I don’t mind if you paid someone to do it for you. It’s so cute, and I can’t wait to do it! I have all the materials already except for the most important one- the SOCKS. Do you mind if you could give me a recommendation of online and offline shops to get the socks from? 🙂 Thank you!!!! I bought my sock from a local shop called Sox World. Heard that they import most of their sock from Taiwan. As far as I know, they don’t have online store yet. Wow, Amanda, well-done on your dragon!!! Love it and thanks for showing it to us!!! Hi, I love this page and all the sock projects 🙂 I tried making the dragon but only had those socks with the toes so my dragon ended up looking like a platypus medusa haha. Thank you for this tutorial! LOL he is a CUTE one!!! Sooo lovely! You are so talented… thank you for sharing! This is SO ADORABLE!! I need to go make one! Thank you for sharing the tutorial and pattern! Too cute, could you make a sock Yeti next? Cool, just googled what is Yeti…. You may adapt the sock monkey pattern to make it. Give it a try, Rachel! I am a big fan of all your paterns. I tried to save the tutorial as a PDF file, like I did earlier with other paterns, but it doesn’t work. Did something change or do you have any tips on how download the tutorials? Thanks a lot! The new print button is not working well (just get to know it few hours ago). I am asking the team to look into it. Meanwhile, please use the old print button which I have just installed back (just below that stretch of buttons) to print and save it. Thank you very much, Anne!!!! Joanne, I have to say that you have a wonderful design perspective. The things that you can do with socks is unbelievable. 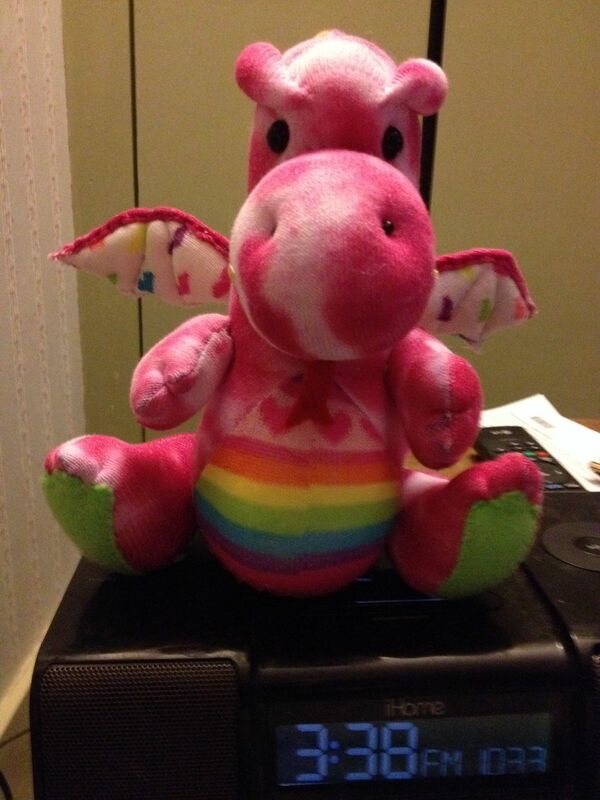 I thought your owl was the best…but now Drake has got to be the cutest dragon any little child would ever want. Thank God for the insight to give you the abilities that you have. And Thank You for sharing them with us. Thank you, Desertrat, for your sweet and encouraging comment, you have made my day!!! Can’t believe this cutie is made with just 2 pairs of socks!! Thank you so much!! This is a great tutorial!! So cute, can’t wait to try this. Thank you. Drake is so cute! One of these days I’ll be ready to tackle a project like this. Thank you for the detailed tutorial. Hi! This little dragon is DARLING! But I can’t get PDF version of the tutorial to display. All I get is the three-page version, not the version with the directions and all the photos of it being assembled. Can you help? I’d love to make one of these. Hi DeAnna, I am not sure what’d happened to your computer, may I know which browser were you using when open this document? Anyway, here is the direct link to template, hope it works. Thanks for the response. I didn’t have trouble getting the template, just the PDF of the TUTORIAL. I can get the PDF of the 3-pages that talk about the dragon, but I’m trying to print off the actual instructions. I can’t get that PDF to download. Now I understand after trying out the PrintFriendly button. The print button can’t recognize the second page so it only generate the first page. Let me try to fix it, otherwise, will have to contact the developer of the button. Thanks for informing and I will get it fix. 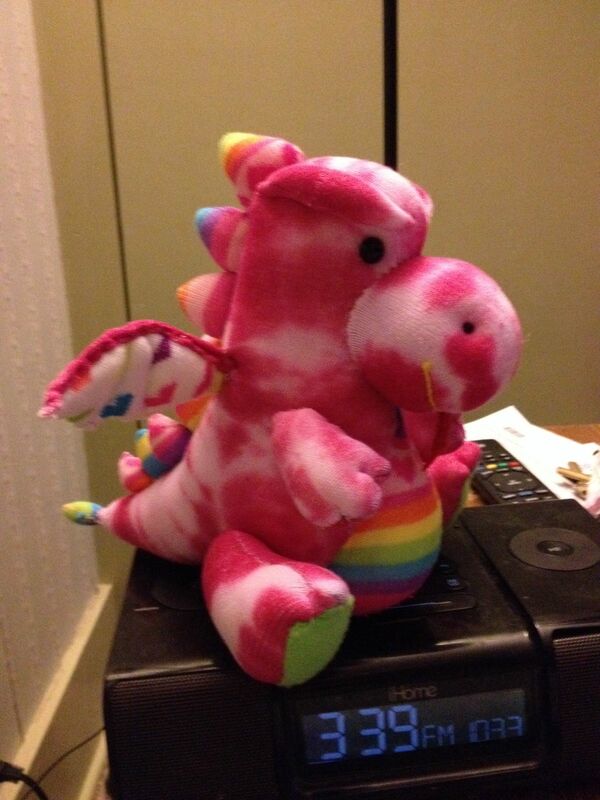 For the moment, you can go to http://www.printfriendly.com/, copy and paste the link http://www.craftpassion.com/2014/04/how-to-sew-sock-dragon.html/2 into the box to generate the pdf document manually. Ahh, Joanne! Your sock critters just keep getting cuter all the time!! !